Thousands of motorists driving along the FDR Drive do a double-take when they glance across the East River to Roosevelt Island and see the brooding grey, Gothic ruins across the water. Totally out of place and time, they look more like a scene created by Emily Bronte or Mary Shelley. In the decade before the Civil War, smallpox was a deadly and terrifying disease, a "loathsome malady." Its rapid spread among the new immigrant population and the poor resulted in more stringent isolation of the victims. Drawing on the centuries-long tradition of quarantining contagious victims on islands, a wooden hospital was erected on Blackwell's Island in the East River. The conditions were subpar, according to resident physician William Kelly, who called the hospital "a pile of poor wooden out houses on the banks of the river." In 1850 plans were underway for a more adequate facility. James Renwick, Jr., who had already designed the beautiful Grace Church on Broadway and in a few years would complete his masterwork, St. Patrick's Cathedral on Fifth Avenue, drew up the plans for a new smallpox hospital. The island would soon be filled with Renwick-designed institutions: the Workhouse, the Lighthouse, the Charity Hospital and the Smallpox Hospital. Because the grey gneiss stone was quarried on site with labor of inmates from the Workhouse, the cost of the structure was kept at $38,000. 354 feet long and 122 feet wide, the three story hospital was topped by a crenellated cupola and could accomodate up to 1200 patients. Visitors would enter through an impressive, heavy stone porch. A devastating fire necessitated the transfer of the one hundred patients of the original wooden hospital to the new building while it was still under construction. Dr. William Sanger assessed the unfinished building and decided it was "admirable." 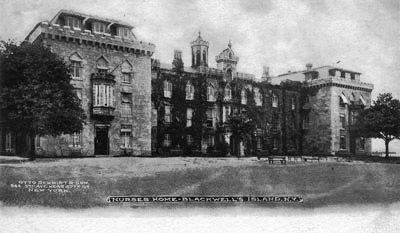 Unlike the other institutions on Blackwell's Island, the Smallpox Hospital was not just for charity cases. Because of the contagiousness of the disease, paying patients were admitted as well. The charity cases were housed in wards on the lower floors -- men to the east, women to the west -- while the upper floor had private rooms for the paying patients. 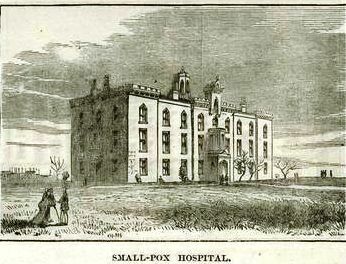 In 1871 another smallpox epidemic raged through New York City straining the adequacy of the hospital and endangering the general population of Blackwell's Island. A year later, 7,000 patients were being treated of whom 450 died annually. That year on March 3 hearings were held on the corruption and mismanagement of the Smallpox Hospital. Patients received little or no care without paying the nurses or doctors. Relatives of the deceased were extorted a fee for a last look at the dead. Former patients and relatives lined up tell stories of the horrors endured there. Margaret Rich testified that "washing was impossible as more than a cup of water could not be obtained except by payment." Although her husband regularly brought food, she "never saw an apple, an orange or a cake in the Hospital," and "The nurses were nearly always drunk, and none of the night nurses were ever sober." A new facility was built on North Brother's Island and in 1875 the Board of Health took charge of the Renwick building. It was converted to the Home for the Nurses and the Maternity and Charity Hospital Training School. In 1904 the large south wing was added. The architects York and Sawyer admirably blended it to Renwick's original design making the addition nearly seamless. A year later a matching north wing was added by Renwick, Aspinwall & Owen, the successor firm to James Renwick, Jr., creating a U-shaped complex. By the 1950s the buildings on what was now known as Welfare Island were becoming obselete. 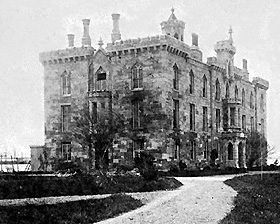 New, modern facilities were erected in Queens and the grey, stone Renwick Smallpox Hospital was abandoned. 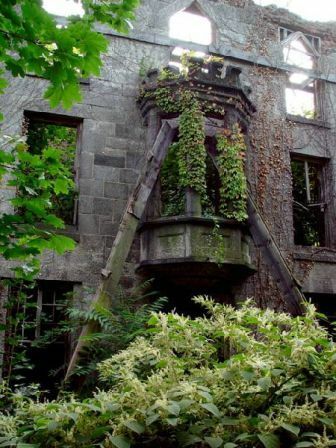 Empty, with no maintenance and left to vandals and the weather, the hospital rapidly deteriorated. A decade later, with no floors or roof, it was in serious danger of collapse. The Landmarks Preservation Commission deemed it worthy of preservation and the New York State Urban Development Corporation hired architect Giorgio Cavaglieri to direct efforts to reinforce the walls. A chain-link fence surrounds the property today and climbing vines cover its stone walls. It has become a romantic, picturesque ruin on par with any found in an English setting. 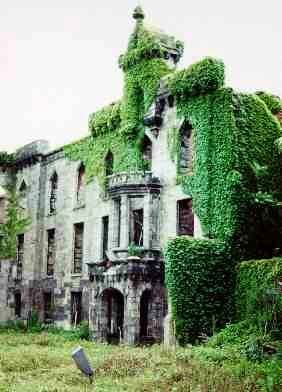 On November 25, 1975 the Smallpox Hospital ruins were designated landmark status -- the only such structure so designated..